Lovely paper holy card, printed in Italy on cardstock. 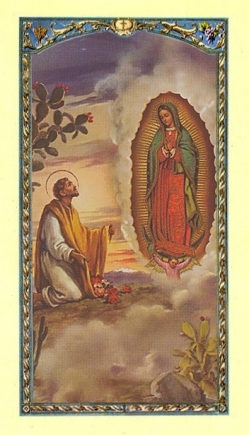 2 5/8" x 4 3/8 Prayer on back: Mother of the True God Most Holy Mary, ever Virgin and Mother of the living and true God, Who became man for our salvation, may the Church, built on the faith of Peter, become a flower garden of sanctity through the prayers of Saint Juan Diego, your spiritual son, where new powers of divine faith will be planted to glorify Your Son and honor you as the mother of mankind. Amen.